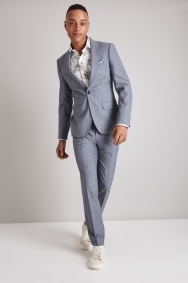 Break away from tradition and let this suit set you apart. 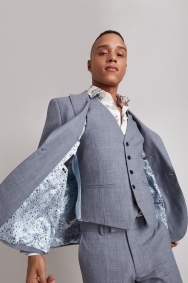 All eyes will be on you when you wear this suit. 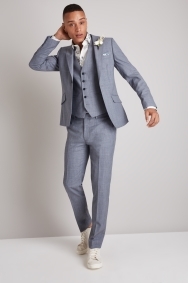 The light blue will stand out against the usual dark hues, which is ideal for lively events. It’s cut in a skinny fit to ensure you look sharp. 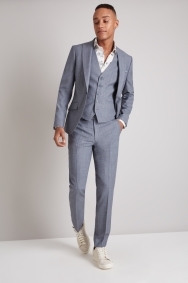 Expect it to be close-fitting through the shoulders, waist and trousers. 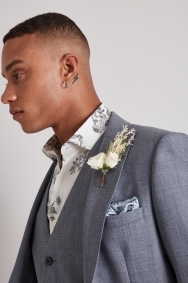 Peak lapels and a patterned lining send out the occasion-ready statement. 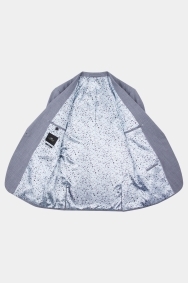 A patterned shirt and pocket square will complete the on-trend look. If you want to go all out for the occasion, why not add a lapel pin? Suit fit perfectly. It looks like the way it looks online. Fast service and free delivery. I also like the way it was delivered in a nice suit bag with two hangers. Great buying experience! 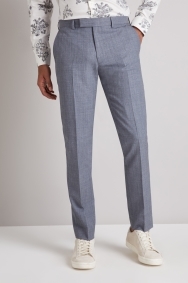 I was actually looking for a gray suit but then I saw this and it is a perfect for my burgundy/wine neck tie. Love the fit and material. Good job Moss keep it up. This is my 2nd order from you. 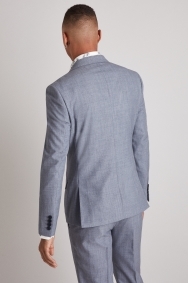 The suit is of great quality, sizing is correct and so the suit fits perfectly. Very happy with my purchase for my partner at our son’s baptism!! He looked very smart but was also comfortable. 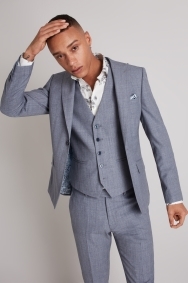 I bought a nice grey skinny fit suit, ideal for work, or smart enough for a function, great fit, fantastic quality, and at a superb price. Nice fit and style for decent price. 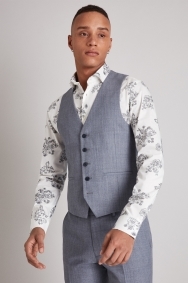 Great quality and fit, light, perfect as I had to wear it in very hot weather.